Are you looking for the perfect dog for your family? Not sure which breed fits your lifestyle the best? Let me introduce you to the Coonhound breeds of dogs and the benefits they have to offer. 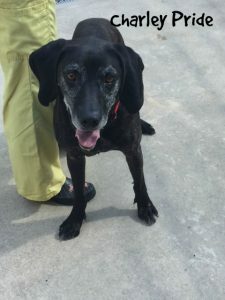 Bellwether Harbor currently has three hounds available for adoption: A Red Bone named Annie, an American English named Winchester and a Plott Hound named Charley Pride. Other varieties of the breeds include Black and Tan, Blue Tick and Treeing Walker, all of which have spent some time here. 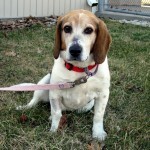 They are a medium to large dog with a short, easy care coat. Coonhounds are energetic and love to be outdoors, but their hunting instincts kick in and will run off leash. This breed of dog is first and fundamentally a working dog. When they are well exercised, Coonhounds are calm and undemanding dogs happily napping in their favorite spot. On the other hand, without exercise, they can be a handful. An owner that will take this hardy dog swimming, running, biking or hunting will enjoy the best relationship. Coonhounds need to be trained with consistent leadership. They love food and are very motivated by it, but be warned they can be stubborn. It is in the Coonhounds nature to figure out and outwit their prey, so they will often do the same with people. This is why most Coonhounds end up in shelters, their owners are unwilling to take the time to properly train or exercise them. Houston noted that when they first brought Ladybird home it took time to build the relationship. They had to be gentle and take their time teaching her the “rules of the house”. 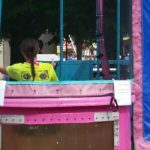 Houston compared it to the way a child will test a new situation to figure out their boundaries. The ideal Coonhound owner is a family that is patient and committed to giving the dog the attention and training they require. They get along with people, most dogs and will be your constant outdoor companion. Just remember to keep them on lead or in a strongly fenced yard. “As good of a dog as Ladybird is, if she saw the gate to the yard open she would run. It is just her nature to chase that scent.” Cautions Houston. Annie and Winchester are available for adoption today! They are happy, bouncy dogs that love to be outside. They do attend weekly in shelter training classes. Winchester has been at Bellwether since November so he is more advance than Annie who just came in June. Charley Pride is in the middle of treatment for a severe case of heartworm and a badly broken leg, but loves to have volunteers sit with him and rub his belly. He will be available for adoption once his medical conditions improve. Thanks to these talented students from Newaygo County Career Tech for bringing the Memorial Garden Arch to life! Bellwether Harbor is excited to be taking another step forward on our Memorial Garden. This spring we worked with a group of students from Newaygo County Career Tech (NCCT) to build an archway that will be the entrance to the Memorial Garden. 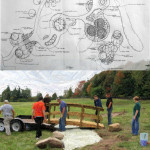 A few years ago, with the help of another NCCT student, a design for the arch was created. In February, Dani Merrill, Executive Director, Carmen Froehle, Building and Grounds Coordinator, and Melanie Baden, Development Coordinator all of Bellwether Harbor, met with students in several different program areas at NCCT including: Construction Trades, Mechatronics, Welding and Graphics. 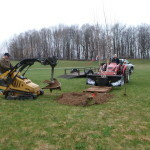 They were presented with the design of the Memorial Garden Arch and asked to develop a plan that included the best materials to use, size and scope of the project. 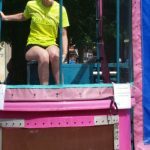 Help the shelter raise money! If you are a new H&R customer and you take our number in they will send us $20. Bellwether Harbor will be hosting a 2 day hands-on seminar, Working with Reactive and Aggressive Dogs. Nationally known trainer Brenda Aloff will be at the shelter on May 14-15, 2016. Aloff is best known for her books “Get Connected with your Dog” and “Canine Body Language”. She focuses on positive reinforcement and correctly reading the dog and responding. The seminar will be held in the Bellwether Harbor Training Room from 9:00-5:00 both days. Reservations will be required to attend the seminar. Please email contactus@bellwetherharbor.org or call 231-924-9230 for more information and ticket prices. This year’s Run Forrest Run will be a timed 5K Run on the Trails of Branstrom Park or a 1 Mile Fun Walk on the paved pathways of the park. The 5K will follow the Fremont Cross Country course. Are you a past cross country runner? Want to see if you can still tackle the course with the same gusto? Are you curious what the current students talk about as being a hard course or would you like to enjoy the morning in one of the most beautiful spots in West Michigan? Then Run Forrest Run is the race for you. Not only will you be helping the animals at Bellwether Harbor but you will have a blast doing it! Ready to run? Sign-ups for Run Forrest Run can be done online at http://www.active.com/fremont-mi/running/races/bellwether-harbor-run-forrest-run-2016 . Silent Auction and Bake Sale will be held in the Lodge stating at 8:00am, race begins at 9:00am. We encourage you to involve your whole family, even the 4 legged members! More event details can be found on the registration page. 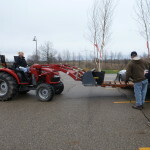 Executive Director Dani Merrill, Building and Grounds Coordinator Carmen Froehle, and Development Coordinator Melanie Baden met with students from Newaygo County Career Tech’s Welding, Construction Trades, Mechatronics and Graphic Design programs in February to begin the next phase of the Bellwether Harbor Memorial Garden. A few years ago a student from Career Tech, Hunter Way, won a contest for his entry gate design. Thanks to a generous contribution from the estate of Robert Schumer we are able to bring life to his design. Currently, the students are working on plans that are best for the winning gate design and will withstand the Michigan weather. 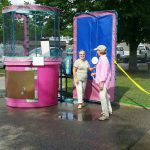 They were also given the task to develop the size of the arch based around a handicap accessible sidewalk that will be installed from the parking lot to the bridge. The students were challenged to think of materials, design and placement that will maintain quality with minimal maintenance. We are eagerly awaiting to see what these bright, young minds present. 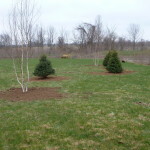 The Memorial Garden is located on the East side of the Bellwether Harbor property. It is our hope by the end of the summer our sidewalk and gate will be in place. Please use the tear off sheet at the bottom of the newsletter to donate to the Memorial Garden or to contact us for more information about laying your pet to rest. 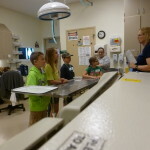 At the direction of Animal Care Coordinator Sheri Church, we are trying a new enrichment program for our shelter dogs. 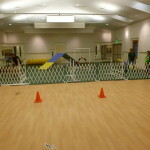 The program is designed to entertain the dogs while they are in their kennels. The activities vary by day so that each dog’s brain stays engaged and stimulated. Different scents are place on the backside of the kennel at the end of the day like: cinnamon, vanilla, basil, lemon, orange or lime. This gives the dog an unfamiliar smell to enjoy overnight. They also have a schedule of toys and treats they get during the day. Our dogs have been enjoying the “Shred a Snack” which is a paper sack filled with treats and food that they can shred and enjoy. Thanks to a generous donation from Karnemaat Farms the dogs are munching on some large carrots. Two nights a week the dogs get a “Frozen Delight” which is kibble, sliced apples, sliced bananas and peanut butter frozen in water. The delights are then popped out of their containers and the dogs have a fun treat to lick and play with once the shelter is closed. After just a short time the dogs are loving this new program and look forward to their new treats! We are happy to say again, Bellwether along with the West Michigan Therapy Dog group, will be visiting Daisy Brook Elementary School, and it’s 3rd grade class rooms. It’s the 2nd year of our program called Pet Pals Goes to School! We have stickers made for the program. The stickers say, “Ask me what I’ve learned! I’m a Pet Pal!” Each child gets one after each presentation. 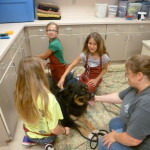 They learned how to stay safe around dogs they do not know, and how to treat dogs in everyday situations. Maybe another child or adult will ask about that sticker and our info can be passed along. We hope to be in other school districts around the county. In March of 2002 Bellwether Harbor opened its doors to the first group of dogs and cats. Abandoned and abused animals have been filling it ever since. The first stop for these animals is the Quarantine area. As you can imagine after 14 years of housing animals, cleaning and disinfecting this area started to show some wear and tear. It became clear that we needed to resurface and paint the area. We had animals living in the area that would need to be moved out of harm’s way. The decision was made in November no more intakes until the project was complete. Thanks to loving families adopting pets into their homes we were able to empty our quarantine area the end of January. This gave the green light for the Quarantine Resurfacing Project. The walls, doors, floors and cabinets will be power washed, sanded, stripped and painted. Once the project is done the Quarantine area will be as good, if not better, then when we first opened our doors. To complete a project of this size comes with a hefty price tag. But for Bellwether the cost is more than just financial. We have not been able to fulfill our mission to rescue abused and abandoned animals during this time. Bellwether should be ready for new animals the first part of March. This will be an exciting time, we will have space for 10-12 cats and 4-5 dogs! That will be a 34% increase to our animal population in a short amount of time! This also means we will incur a spike in animal care related costs like medications, vaccinations and medical treatments with our new guests. Our staff is anxious to begin this project so that we can focus on our mission to help animals. If you would like to donate to our Quarantine Kennel Project please use the “Tear Off” at the bottom of this letter and check the “Kennel Project” box. The Bellwether Harbor staff appreciates your support during this exciting, yet busy time. 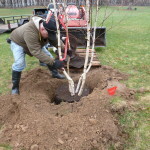 Please check our Facebook page www.facebook.com/BellwetherHarbor and for updates on the project and our new animals as they arrive! A lot of great things have happened at Bellwether in the last 2 weeks! 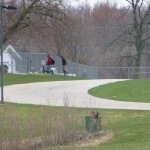 Pet Pals on the road visited Henning Park in Newaygo. That group of kids were with Summer Magic. 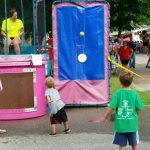 We also traveled to Saranac and Clarksville for their library’s summer fun program. And just yesterday we had Pet Pals here at Bellwether. 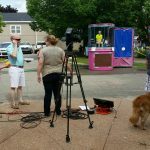 Tons of kids talked to about being safe around pets and dogs they do not know! 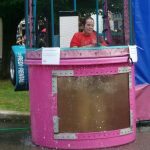 Different community groups were able to raise money at the 2015 NBFF Dunk Tank in front of 5/3rd Bank. 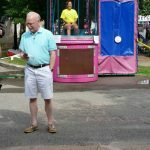 Bellwether Harbor was fortunate to have WZZM 13 Grand Rapid’s George Lessens doing a weather broadcast at the time. 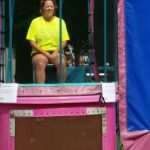 Thank you to those who donated money to dunk a Bellwether Harbor staff member! In the months of February and March, Bellwether had over 200 kids ages 3-5 from Grant and Hesperia Head Start and Newaygo Daycare come and visit. They watched a video about being safe around dogs they don’t know and techniques to protect them from stray dogs. All the children practiced “standing like a tree” and “curl up like a rock” while meeting some of the shelter dogs. We are happy to announce in mid-March, Bellwether along with the West Michigan Therapy Dog group, will be visiting Daisy Brook Elementary School. It’s the kick off to our program called Pet Pals Goes to School! We had stickers made for the program. The stickers say, “Ask me what I’ve learned! I’m a Pet Pal!” Each child will get one after each presentation. Maybe another child will ask about that sticker and our info can be passed along. Got to love the domino affect! If a few kids can remember the things they learned, it might save them from a bite. Possibly they may teach a younger brother or sister or even their mom or dad. Bite prevention is our main goal when teaching kids dog safety. This summer will be our 9th year for Pet Pals at the shelter. 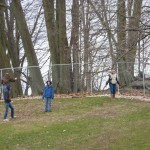 Kids can spend a few hours learning shelter things and also dog safety. This July we will be traveling to Saranac, Michigan. 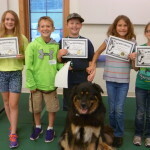 It’s the farthest Bellwether has ever gone to help kids learn dog safety and bite prevention. “Pets Pals on the Road!” Just Perhaps?! In February, we had some young scientists visit our shelter and they wanted to create an experiment with some of our cats. The girls wanted to see if the shelter cats preferred store bought cat toys, toys the girls had made themselves or just random items laying about. They made tally sheets with names of the toys and what cats used what toy most. It was interesting to watch for sure. A few short weeks later, we learned that the girls won blue ribbons at their science fair! Come and join us at our 12th Annual Holiday Open House! This is our 10th Anniversary for Run Forrest Run! 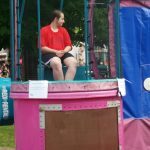 It’s our biggest fundraiser of the year! Frisbee catching demo and Frisbee catching contest held by Bill Camp and his Famous Flying dogs! 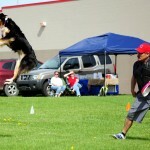 The Rockin’ Rovers are a Canine Freestyle performance troupe in the West Michigan area. They will perform freestyle dance demos with their dogs. There will be a costume contest for dogs, meet with Canine Officer Turbo, Food by Two Hot Tamales, Pinnacle Popcorn of Rockford, Michigan and Pet photos by Treasured Images. We will have a petting zoo and pony rides, West Michigan Therapy Dogs, Blessing of the Pets and a walk to Honor all Pets and Families, Silent Auction, Bake Sale, Guest speakers and Vendors! We’ll have kid’s games and as always, a walk of the shelter grounds in honor of all pets. We need your help! Bellwether Harbor is a non-profit 501(c3)organization that relies on donations to continue our mission; to encourage and support the human animal bond. Please ask your family and friends to give and help out the animals in our care. 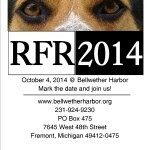 Can’t make it to RFR 2014? No problem! You can use the PO Box address and send your donation. Also, there will be a donation button on our website’s homepage marked RFR 2014. Donations brought to RFR 2014 will receive prizes. No one will leave empty handed! Remember, you can make a difference in the life of a Bellwether cat or dog. Thank you! We had 5 awesome kids come into Bellwether Harbor for Pet Pals today! 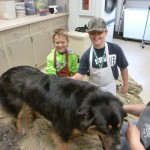 They got to experience what we do in the shelter and a small taste of volunteering. Thanks for coming today we are proud of you all! 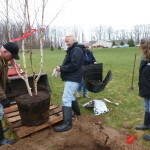 Friday April 25, 2014 was Arbor Day. 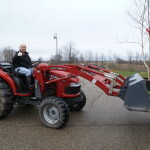 Just last year we broke ground on the Memorial Garden and today we planted the big trees of the layout plan. 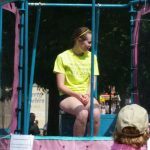 On Thursday April 24, 2014: Students and staff of Fremont High School had Packer Pride Day – Community wide day of service throughout the City of Fremont. A great group of ladies came to Bellwether Harbor to help with clean up! Thank you FHS for supporting your community and Bellwether Harbor! Summer 2013…WOW where has is gone? We have had 3 Pet Pals classes, kittens born, puppies bottle fed and donations were given and received! Now were are getting ready for our Biggest Fundraiser of the year!! On October 5th from 11:00 AM to 1:00 PM, we will be celebrating our 9th Annual Run Forrest Run, otherwise known as RFR 2013. 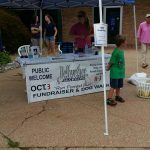 Amazing kids raise money to donate to Bellwether Harbor! This is a letter from Hesperia Project Focus and Pace. As part of a philanthropy project organized during the Speak Up! leadership conference, students from Hesperia Middle School and Hesperia High School participated in a walk-o-thon to benefit local animals. While a Speak Up!, students decided that the well being of animals in the community was something they all felt passionate about. 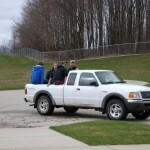 On March 30, 2013, students, friends, and family arrived at the Hesperia High school track to eat cookies and walk laps. For each lap walked, students were able to collect pledges made by the community. Students Ashley Ward, McGwire Cechura and Kirsten Clark were able to collect $229.25. We thank you for supporting a cause we all believe in! 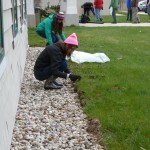 The students and staff of Fremont High School planned an Earth Day – Community wide day of service throughout the City of Fremont. 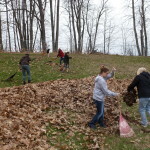 On Wednesday April 24, 2013 they came to Bellwether Harbor to help with clean up! Thank you FHS for supporting your community and Bellwether Harbor! Our goal is to provide community service and to teach the students of Fremont High School the importance of giving back to their community and to society in general. As a school we would like to take a day and help clean-up, fix-up, and give back to the community of Fremont. Students and staff members will come to your home or business to lend a helping hand. 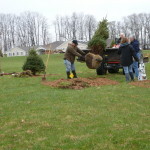 Jobs we can do include, but are not limited to: raking yards, planting flowers/trees, painting, cleaning up outside areas, breaking down boxes, sorting materials, helping around the farm, etc. We look forward to serving you! A few young, outstanding kids from the Fremont Middle School after school progrom, visited Bellwether Harbor at the end of March. They brought with them treats, toys and lots of smiles. 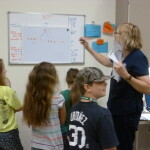 They learned about proper ID for their pets, had a math problem about one cat and the over population that can occur from not spaying or neutering and visited with a few of Bellwether Harbor’s pets available for adoption. 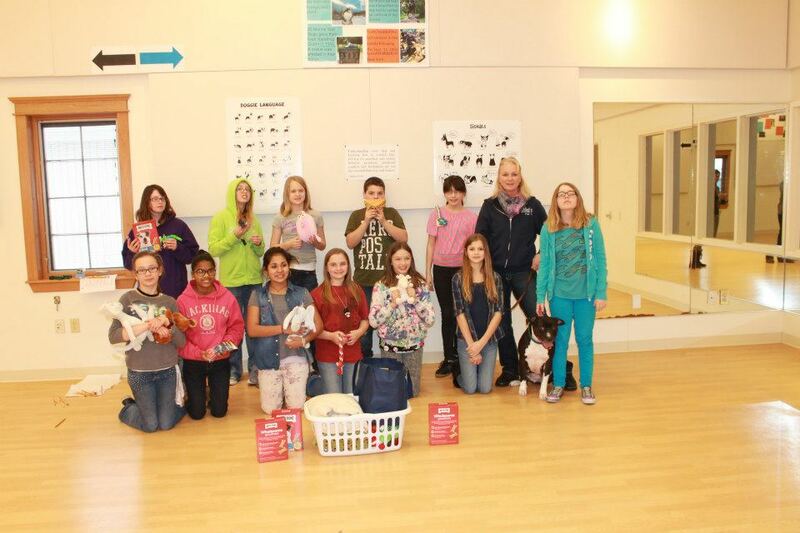 Thank you FMS students for visiting and the gifts for the shelter! Bellwether’s year began with a miraculous story. 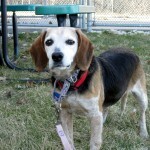 In February of 2011, the shelter took in 2 elderly beagles. They were obviously bonded and very much ‘in love’. Bonnie and Clyde lived with us for almost a year, hoping that their new family would come along. Instead, something even better happened. 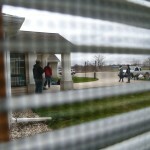 One quiet day in January, a young boy showed up at our doors asking about Beagles. Their family pets had disappeared almost a year before. The family happened to see photos of Bonnie and Clyde and instantly recognized them as their beloved pets. Bonnie and Clyde (actually Daisy and Gunner) were overjoyed to see ‘their boy’. They are now back home with the family of 8 that has loved them since they were puppies. Along with the great joy comes a very important message, if your pet is missing, please contact all local shelters and rescues. Your best friend may just be sitting there waiting for you to find them. The year end fundraiser is most fun, because the shelter is decorated with greenery and lights. So many scrumptious homemade treats are made and displayed at the Gourmet bake sale. Santa appears for the young and old, starry eyed kids and pets for an opportunity to sit and have a photo taken with him. Bellwether’s Boutique is always available to buy all your pet’s holiday presents. And a the micro chip clinic too! It is so nice to see many new faces and some familiar stop by the open house to partake of the festivities. It was a fabulous turn out and money raised will help with shelter operations.